Pedersen + Lennard have been getting a lot of attention lately so I went to see what the hype is about. The guys met me at their coffee shop called the Field Office in the East City precinct. Nice shop, but I thought you were in the furniture business? Well we initially opened the coffee shop to support our main business which is furniture making. It ended up being such a success that we’ve appointed Will Sandwiches to run it because it was just taking up too much of our time. We use it as a meeting place and showroom for our work. We’re also in the process of moving our factory to the Woodstock industrial centre [66 Albert road], which will be a showroom/ manufacturing/ retail space and of course…a coffee shop. Hmm…coffee…I see you’ve got the guys from Deluxe Coffee Works involved. Do you drink a lot of coffee? Definitely, I’ve already had two doubles today, so I’m a bit on edge, which is why I’m on coke at the moment, says Luke. You’ve got to pace yourself when you’re surrounded by good coffee all day otherwise you lie awake at night levitating. What is it about furniture that gets you excited? The smaller details. How things come about, how they’re manufactured and put together. When you see somebody looking underneath your table because they’re trying to figure out how its put together. That’s a small victory. You can’t see it from the outside so you’re going to have to go underneath. That’s an interesting point you’ve touched. There’s a lot of knock-off going around. Are there specific steps that you take to protect your designs? There’s not much you can do. We decided early on that we must be ahead all the time, and make sure that our quality is high. We’re selling a brand, it’s an original thing. It’s kind of relative because selling bucket stools is a lot easier than selling tables. The bucket stool is a great piece in terms of creating awareness around the world. For me it was a success because it represents a fusion of art and craft and machine. That’s our first one, says James pointing towards the shelves at the rear of the shop. The recycle bins are selling well at the moment. We realized that there aren’t any nice looking bins around and generally people don’t have space inside the cupboard which means that the bins will be visible. We have about ten colours which are changing all the time. We do custom colours but because its powder-coated, we’re still limited by what’s available. Is there anybody you wouldn’t work for? Not really, but we will try and twist the brief to suit us. The things you do have to be worthwhile either financially or strategically. If you take on things that you don’t make money off or which aren’t part of your strategy then soon you won’t exist. If it’s something that will work for us in the future we will do it, but were not prepared to do something that’s far from our aesthetic. And from a moral point of view? We wouldn’t do work for Mavericks. We don’t like the way they sell women’s bodies. We don’t have the same moral values and despite the fact that we’re making furniture not lingerie, you put your brand in line with theirs and people will make the association. If we don’t want to be associated with what you’re doing we eventually find a way out. That’s a good way of protecting your brand considering that there are enough people out there looking for good stuff. We’re building a brand and we have a great track record. We work hard at keeping our quality high and our customers are always really satisfied. We had an instance were a Formica top which we had installed started delaminating , and that was the first time in three years where we had to re-manufacture which we did straight away. It’s not a case of just taking the money and running. You can do that if you’re going to open up next year under a different name. For us, we’ve put our own names to this thing so it’s a career. What’s your take on the Toffie festival? It’s cool, says Luke. I gave a talk there last year about the ‘green’ concept, which was a bit of a contradiction because the timber we use, Scandinavian Birch is imported from overseas. The kit then gets made up in our office and is often sent to clients around the world. So ironically it’s a very un-green story. We got a local illustrator called Dale Lawrence, to do a tongue-in-cheek design based on this idea. The design, which was laser-etched into the chair, showed different warning labels similar to what you would find on food, “Contains traces of nuts” or “This tuna is dolphin-friendly” etc. Do you have any other options in terms of timber? The point of the talk was that despite the large carbon-footprint, the fact that the product lasts so much longer than the local material, makes it more sustainable. We made the same chair in pine and it broke all the time. None of the birch chairs have broken. The pine also needed hours of sanding for a decent finish which was a huge waste of material and just not practical… It made for an interesting debate. We also try to keep our wastage down to a minimum by taking board sizes into account which makes it more sustainable as well as helps us with our margins. We are also lucky in that most of our waste can be used for other pieces such as our bin lids. 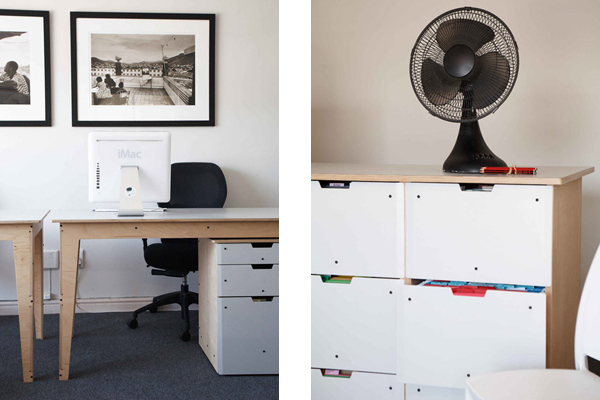 How can people get hold of your furniture? Our website. People order from there and we distribute. 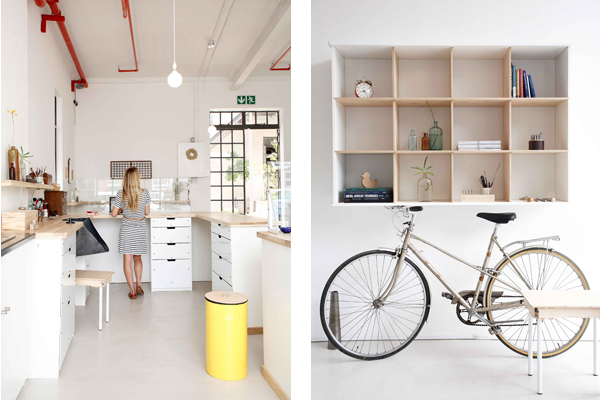 Most of our customers are not in Cape Town, which is why we put so much effort into our flat-pack range. Everything folds into a flat box which really cuts down on transport costs and is easy to assemble. Luke points to the Fairlegs table; you place the top upside down, insert the four legs and fasten the one allen key bolt and that’s it. We even include an allen key just in case they don’t have their own and that’s all you need. You guys collaborated with Valchromat on some furniture which I saw at the Design Indaba. What’s the story? They came to us a year ago with some samples and told us to try it out and see what we can do with it. We wanted to show the material in a furniture light as opposed to the usual cladding application so people could see what is possible. Is it a material you would like to explore further? Yes but unfortunately it does have constraints, as a surface it isn’t as hard as birch, so how you treat and finish it is the key. For the Indaba we left the material in its raw form because we prefer the colours. One advantage is that it is waterproof even in its raw form and the board size is also bigger than birch so there’s less wastage. 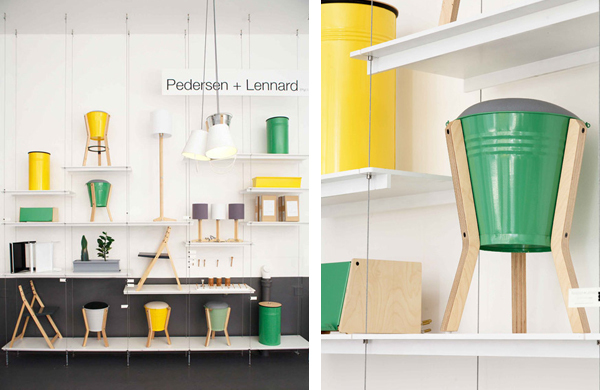 For more information on Pedersen + Lennard have a look their website or drop by the Field Office to check out some of their pieces.